I've been looking for something to listen to on the drive to work and this is just the ticket. I listened to the audio version of this book so, as usual, I wasn't able to take notes and succeeded only in jotting down some thoughts when I got to work or back home from the drive but I'm minded to track down the hardcopy version of this book and give it a proper read. I often listen to radio programs or visit websites where evangelicals/fundamentalists square off against secularists (or they're commenting on their opposites). I cringe when the former claim the Founders were Christians and that the United States is a Christian nation. I cringe as well when the latter claim that the Founders weren't all that Christian and that the United States isn't a Christian nation. They're both wrong, and Stephen Prothero's Religious Illiteracy is a good introduction as to why that's so. Technically speaking, the secularists are right: America is not a "Christian" nation. "God" is mentioned nowhere in the Constitution and the federal government (and, after the 14th Amendment, states) is forbidden from establishing or restricting the exercise of religion, and there are no (formal) religious tests for office, but in all other respects, America is profoundly Christian. Or it was. In the last century we Americans have had to accomodate and live up to the ideal of religious tolerance to a far greater extent than the Founders ever imagined (and present-day right-wing evangelicals want). All this is secondary, though, to the purported chief purpose of this book and that is to document the appalling religious illiteracy of the American public. 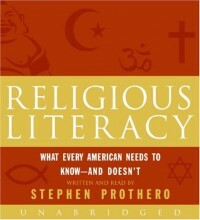 "Illiteracy" has two forms: The first is ignorance of other faiths. The second is ignorance of one's own faith. It's this latter that Prothero focuses on - how did it develop and why does it matter? As to development - The "fault" lies in the nature of Christianity as it evolved in America. Correct doctrine dominated religious dialog from Luther's theses down to the Revolution. The smallest differences in liturgy or theology could set two communities at each other's throats and informed believers knew why they were Puritans or Methodists or Congregationalist or Quakers, etc., and not something else. The marketplace of religions that arose in the wake of the Revolution fostered competition among creeds and the triumph of evangelical Christianity* in the 2nd Great Revival meant that the emphasis fell on a personal relationship with Jesus Christ at the expense of doctrine. 1. The Catholic "invasion" of the country in the 19th century prompted Protestants to draw together against the tyranny of the papists and de-emphasize any differences. 2. The threat of Godless Communism prompted Christians of all kinds to band together. 3. Today, it's the "threat" of Islam that is bringing Christians together in an effort to define themselves against the Other. If there's anything this survey lacks it's a concommitant look at American Muslims (or Buddhists, Hindus, etc.) to see if there's a similar level of ignorance amongst their congregations. I'd recommend the book, especially the first chapters. Chapter 6 - the dictionary of religious literacy - makes for some dry recitation; the meat of Prothero's argument is in the first chapters and more interesting. If you're a believer it may spur you to take a closer look at the distinctiveness of your beliefs; and whether you're a believer or not, Prothero's overview of American cultural history is eye opening and instructive. * Don't make the mistake that present-day evangelicals make of equating their beliefs with those of 18th and 19th century evangelicals. The problem with modern evangelicals claiming that the Founders would be on their side is twofold. One, the Founders, by and large, weren't evangelicals; and, two, the evangelicals of the early Republic had different concerns and beliefs than their modern counterparts.